"Comrade General, instead of a decoration, could I go home to see my mother?" Following the USSR's harrowing experience in World War II, the Soviet screen was filled with big wartime spectacles celebrating, of course, the collective will. During the late 1950s, however, the focus shifted somewhat to more personal tales of life during the war. 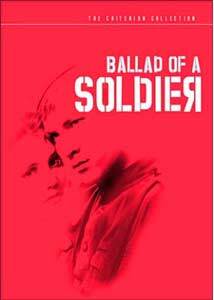 A splendid example is Grigori Chukhrai's Ballad of a Soldier. The movie begins with a pair of prologues. In the first, we see Alyosha's grief-filled mother (Antonina Maximova) watching the road to town, down which her son will never come, having died in the war. The second prologue is a flashback to the war, where we see 19-year-old signalman Alyosha (Vladimir Ivashov) accidentally become a hero, destroying two German tanks single-handedly. As a reward, he is allowed to go on leave for two days to visit his mother. The movie proper concerns Alyosha's odyssey to reach his mother, including a variety of moving and humorous incidents, as well as falling in love with Shura (Zhanna Prokhorenko), a young woman he meets stowing away in the boxcar where he is riding. Alyosha is a throwback to Dostoevsky's Prince Myhkin, both in his unfailing good-heartedness and his clumsy falling into events. Ivashov does a fine job of portraying him as a wide-eyed innocent who also represents hope to the populace eager for news of the war and their sons. Prokhorenko is luminous and highly appealing, both in her sweet and shrewish modes. The cinematography for the most part is attractive but workmanlike; the one striking exception comes in the battle sequence, as the camera, following a tank pursuing Alyosha, flips upside down to continue the chase completely inverted. Accompanied by a score that is reminiscent of Herrmann's main theme for North by Northwest, this provides a suspenseful yet slightly off-kilter moment in the proceedings. There is a beautiful moment where a cloud of smoke from the train dissipates to reveal Shura standing on a bridge. Some other matters are also handled unconventionally; for example, the love scenes evolve mostly through the expressions on the faces of the protagonists; they never kiss, and they hardly embrace. This may reflect a certain amount of Oedipal conflict, since young Alyosha is so single-mindedly set upon his mother for much of the running time. Oftentimes the lovers are double-exposed with woodlands, in a hopeful contrast to the blasted and war-torn scenery that actually passes them alongside the train. One might consider this Russia's answer to The Best Years of Our Lives, not quite after the war, but expressing what might have been had the war not dragged on so long. There is despair, but there is also hope. The fact that Alyosha dies in the war would seem to represent a death of innocence and hope, but this is also belied by the glimpse in the prologue of Alyosha's childhood sweetheart, now with a husband and an infant in her arms. Image Transfer Review: The black & white full frame picture is generally quite attractive, with good detail and fairly good black levels. The source appears to have been heavily restored, for it has very little in the way of scratches or speckles. There are some occasional video artifacts, however, that are somewhat distracting. The patterned dress of the mother in the first prologue is a nightmare of moire artifacts. The frequent diagonal lines are full of jagged edges, even on a progressive player, which leads me to wonder if the progressive flags may be encoded improperly. Significant edge enhancement is also notable during the tank sequences. Audio Transfer Review: The 1.0 Russian track is the typical poor audio found on most Russian films. The hiss and noise is fairly constant, the music is tinny and thin, though the dialogue generally sounds all right. Bass and lower midrange sounds are completely absent; this leads the battlefield sequence to sound quite ridiculous, without any punch at all. Similarly, the audio only captures the high treble and none of the rumble of the train. Extras Review: The extras are quite scanty on this release. An audio interview (14m:15s) with the stars and director, played over stills from the film, is disappointing in that the questions and answers have to go through a translator, and this process takes most of the running time. When you add to that the fact that the questions are mostly insipid and unenlightening, the interview is not very notable. The Russian answers are subtitled, so the viewer can get another take on the response, not always quite what the translator says. Some of the responses are contradictory, leading to utter confusion. A lengthy set of production notes is included in the accompanying booklet. A beautiful and poetic meditation on the effects of the war on Russia, given a mediocre transfer and little in the way of extras. Definitely worth a look nonetheless.